Over the last 18 months, US equities rose on 80% multiple expansion and just 20% earnings, and they diverged from economic fundamentals. 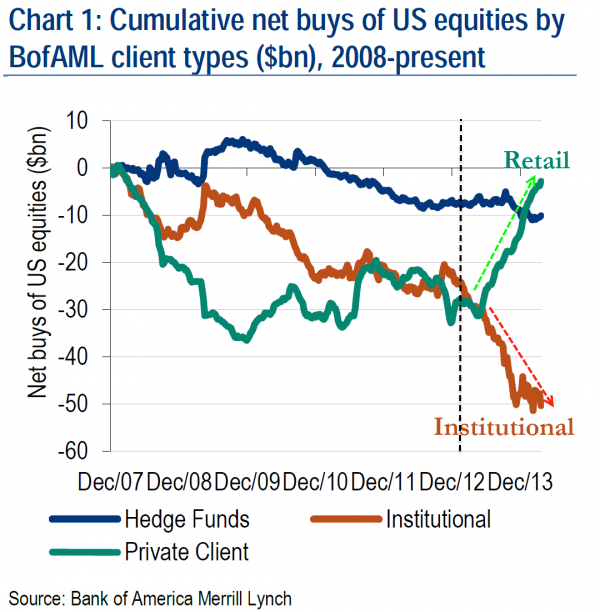 Institutions were net sellers in this period whilst retail investors became the buyers, typically the ‘dumb money’ and a sign of a peak. The carry trade ceased to be fuel for higher prices. 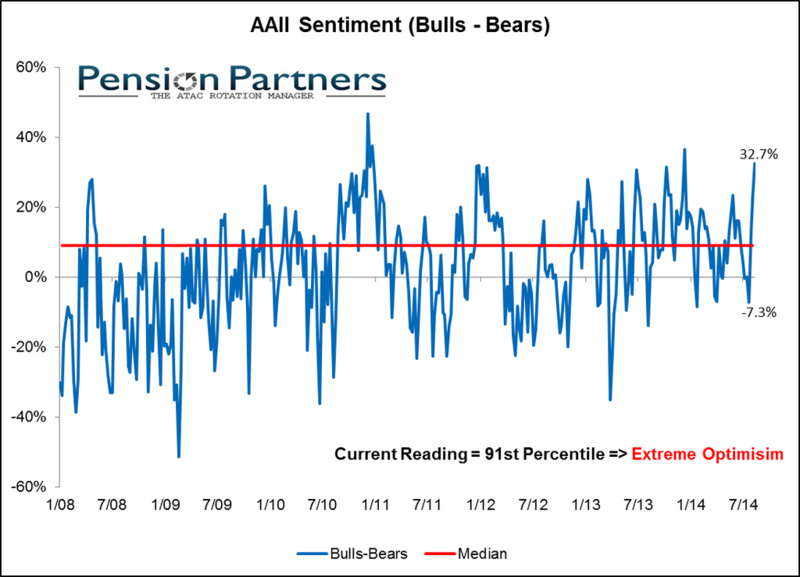 Instead, retail investors went all-in on bullish equities allocations and then leveraged up in a major way, to propel equities higher. 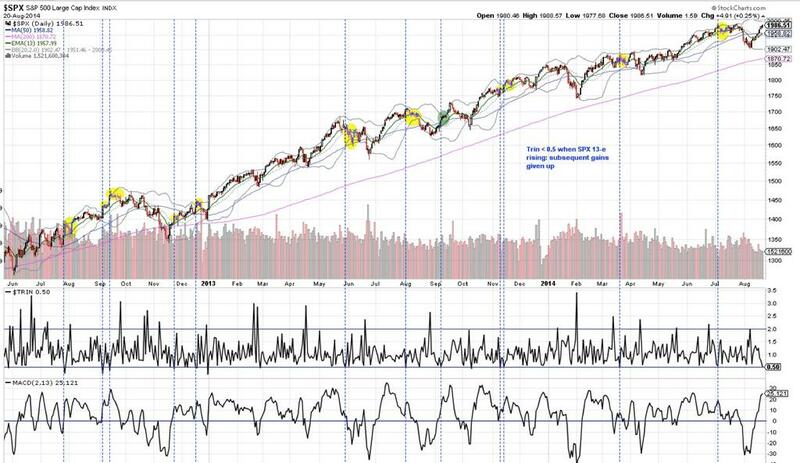 We see a trend of distribution in this period, both in major accumulation days (just 1) versus major distribution days (12) and in Chaikin money flow, which suggests underlying building smart selling pressure. In short, the stock market mania of the last 18 months has been fuelled by the retail crowd and their credit facilities, not manipulated by the big institutions in some sort of cartel as some suggest. The whole process can be explained by the rise into the solar maximum, driving people to speculate. 1. 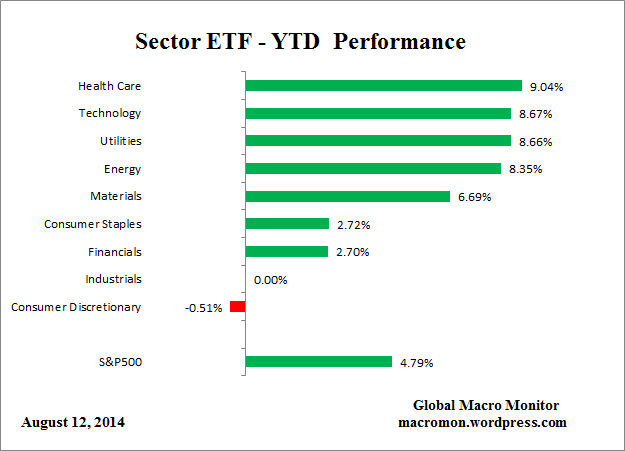 The best performing asset in 2014 is treasuries. 2. 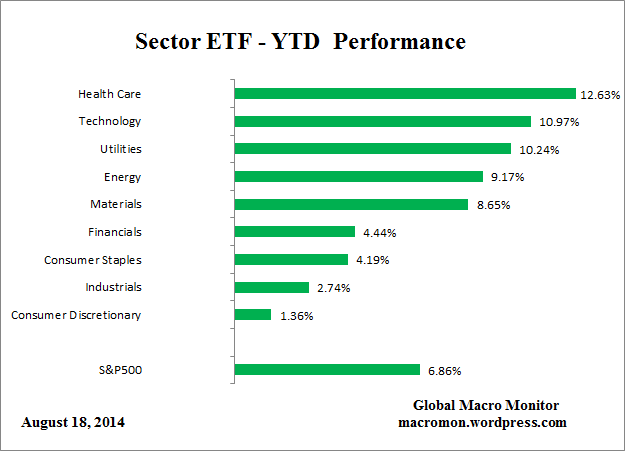 The best performing sectors in 2014 are utilities and healthcare, the defensives that typically outperform post market peak. 3. The hot speculative targets of Bitcoin, social media stocks and small caps all appear to have topped out, with Biotech a question mark but having made no progress since February. 4. Margin debt has also made no progress since February, which remains the peak. 5. 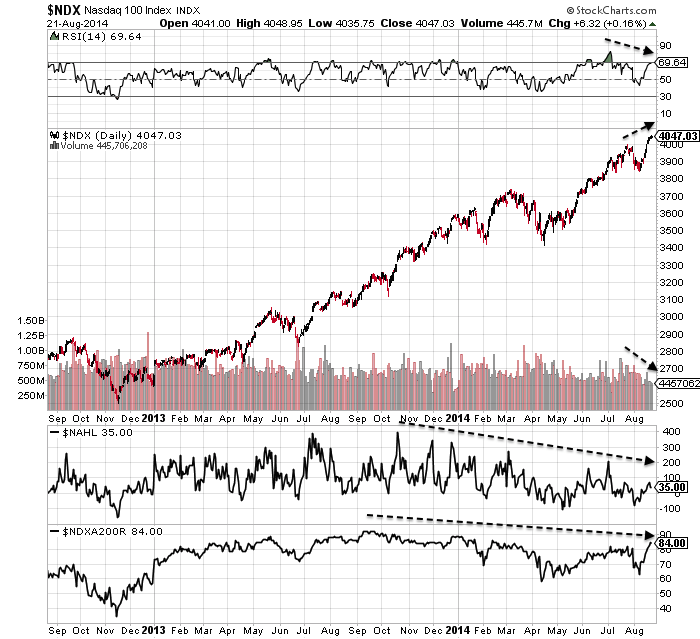 Divergences have grown in breadth, sentiment and risk measures. 6. 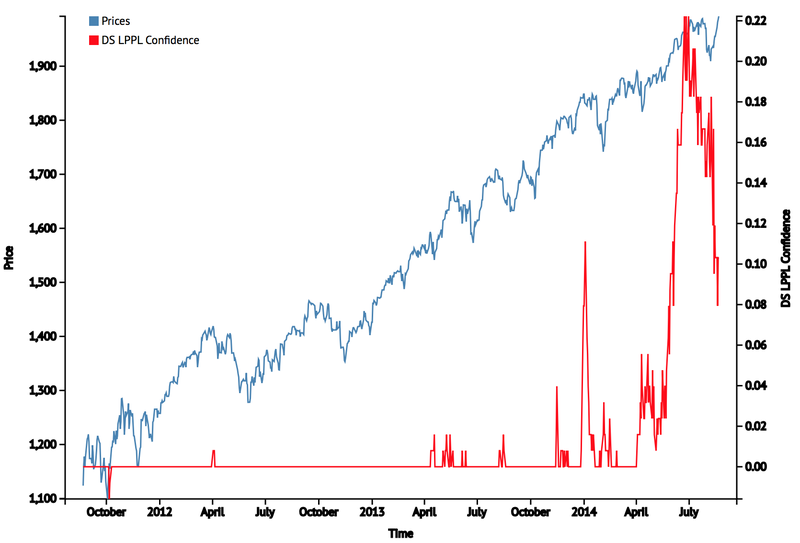 Volume on down days versus up days resembles previous peaks. 7. 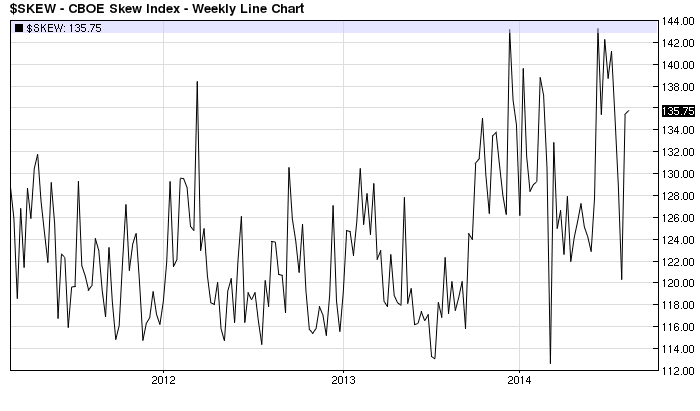 Sornette bubble end has flagged and extreme Skew continues to warn of a big move to the downside. 8. 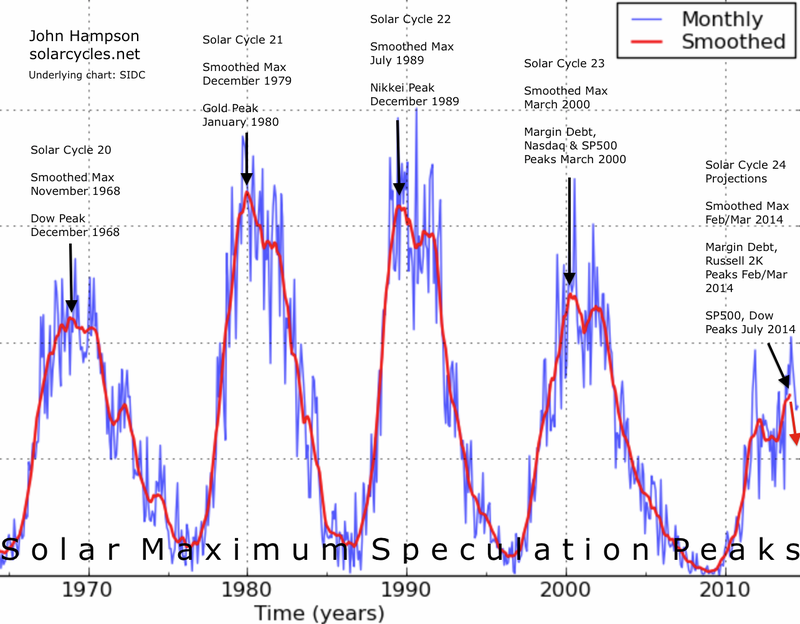 The smoothed solar maximum appears to have passed around Feb/March time. 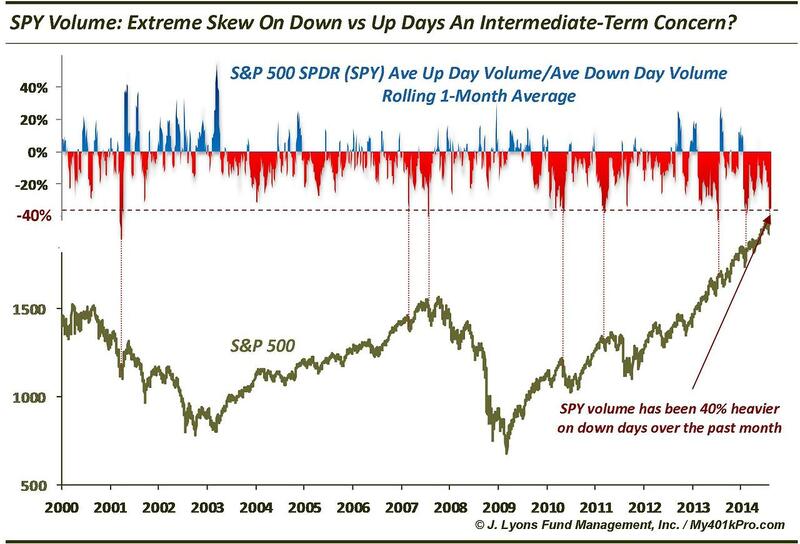 Turning to the short term, yesterday was another record ultra low volume day. 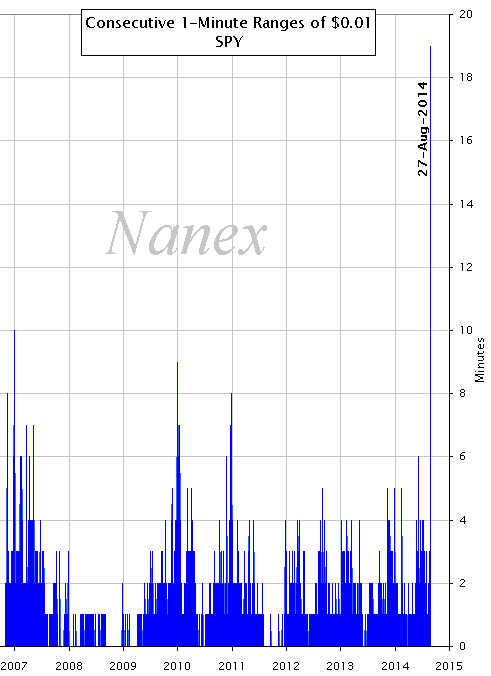 Also, $SPY remained in a 1 cent range for 18 minutes, almost dead, beating a Nov 2006 extreme of 10 minutes. Indices went nowhere overall, so we roll over to today. Geomagnetic disturbance is underway. To sum up, my bottom line is this. Whatever research angles I collate always point to the same: a comprehensive multi-angled case for a bull market peak, and not just a peak some time soon, but the last gasps of a peak that has been in progress all year. We can argue over select indicators and doubt them individually, and no-one can avoid confirmation bias. But the breadth of the indicators and differentiation of the angles make for a multi-way, cross-referenced set that is surely something objective and compelling. 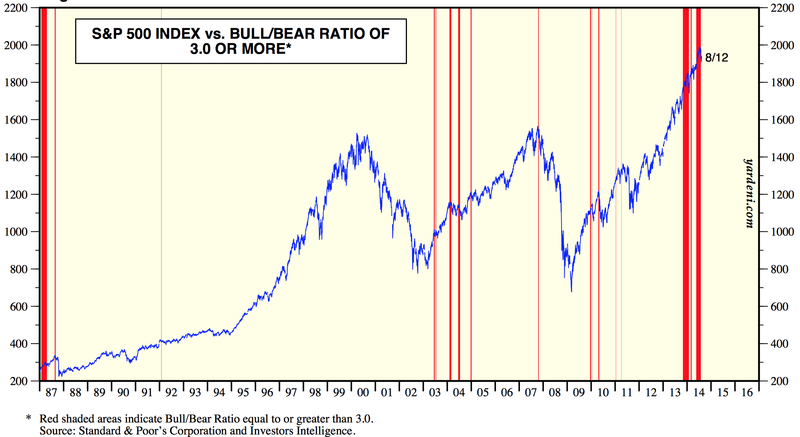 The evidence just does not support a bull market continuation from here nor a parabolic blow-off top from here. The evidence says we should collapse any moment, not just into a correction, but into a devastating bear market with all that retail leverage and skewed allocations unwound in a very painful way. Clearly price is all that ultimately counts, and therefore you should maintain a healthy doubt about my case until price proves it. 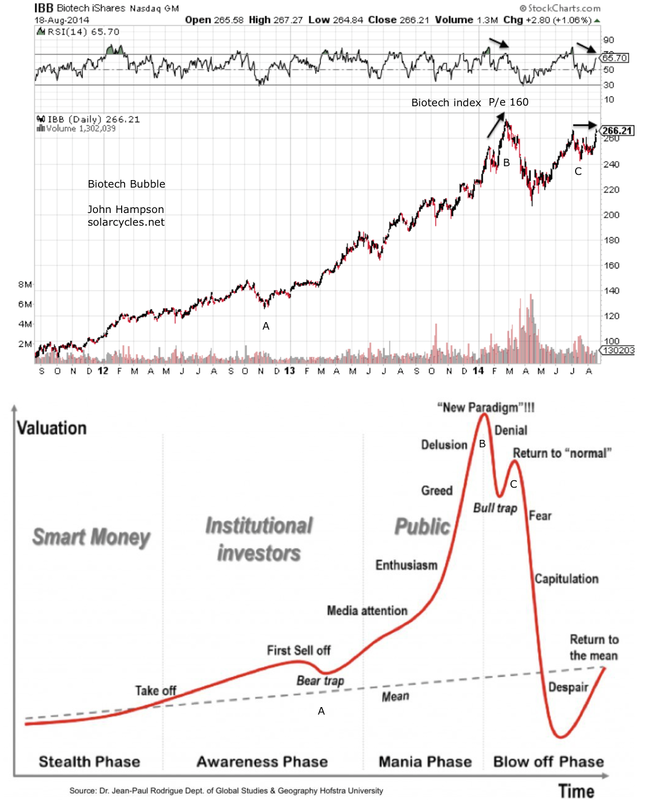 But, rightly or wrongly, I still think this is it: the stock market mania began 18 months ago; risk peaked 31 Dec 2013; the solar max, margin debt, hot sectors and indices peaked Feb/Mar 2014; and the last phase of the top was July/Aug with the Sornette bubble peak, European indices peaks and US indices peaks. 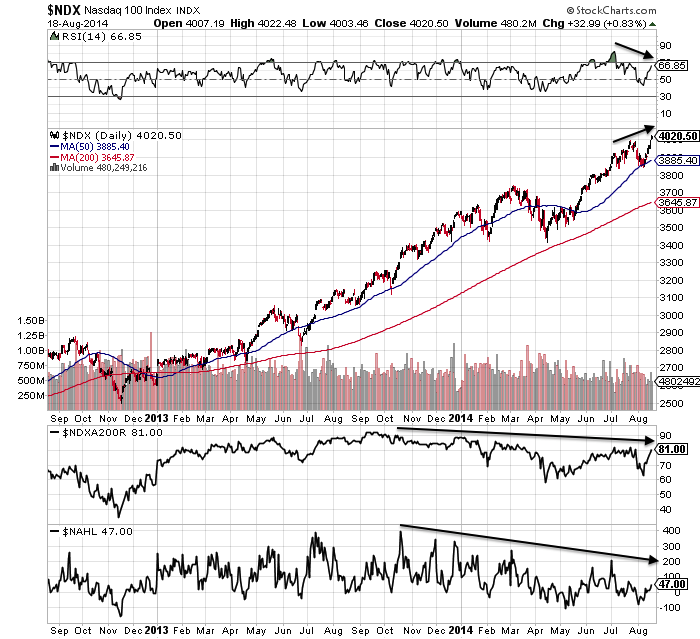 I believe the current ultra-low volume double tops / marginal higher highs on negative divergences in Dow, SP500, JNK and IBB will resolve to the downside, and the devastation be reaped in September and October. In other words, this market needs a reset to continue. 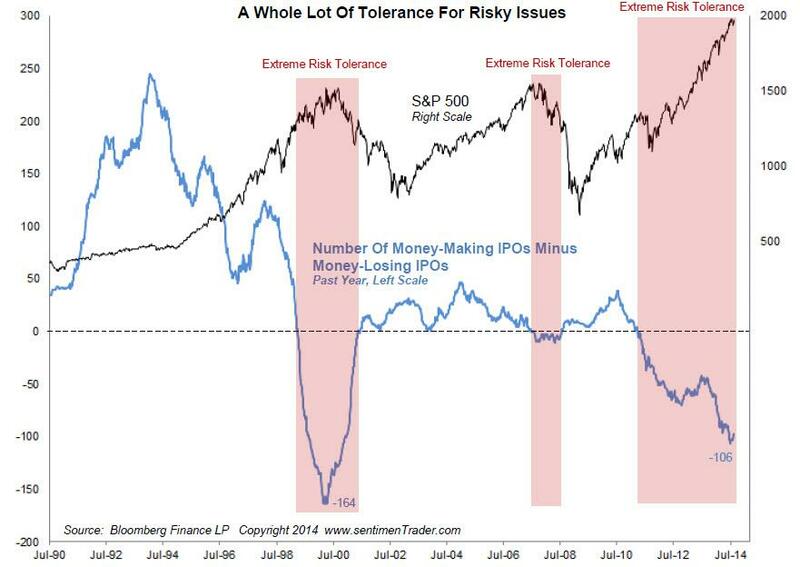 The duration and magnitude of these indicator extremes mirrors 1987. The market is a mean-reverting mechanism and like an elastic band it will snap back. Therefore a significant reset is on the cards, and every day it has gone without a washout correction has stored up a major correction when it occurs. 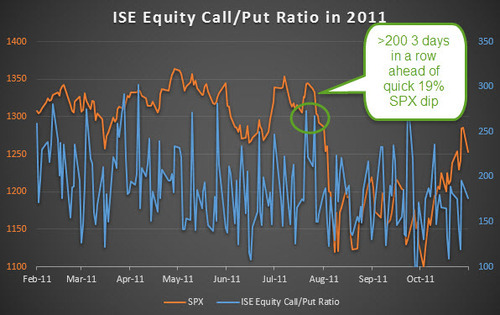 Therefore, even if the market were in a secular bull heading much higher, it is over-ripe for a cleansing. 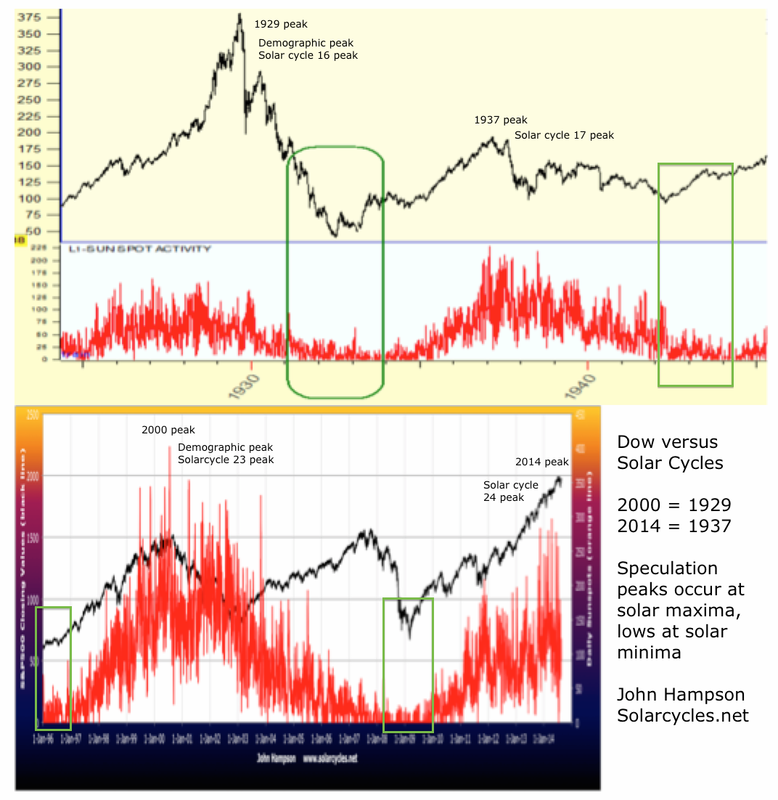 The maturity of the divergences and readings suggest the inverted geomagnetic seasonal downtrend from August to October is the most likely window for that to occur. 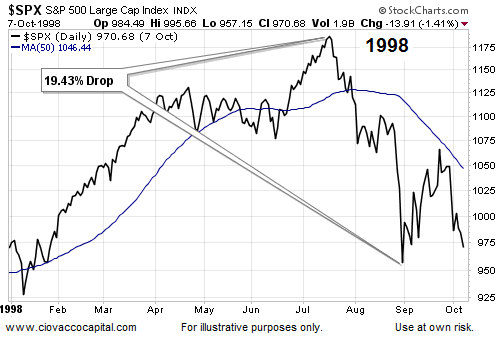 The secular bull break outs post 1930s and 1970s also saw a reset shortly after breakout. 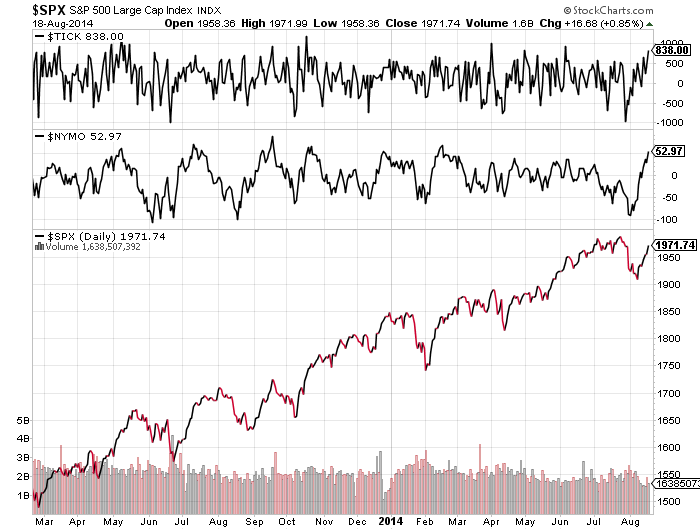 Stocks, although stretched, are heading for a blow-off top. The kind of unsustainable trajectory that everyone knows can’t last but no-one wants to miss out on. 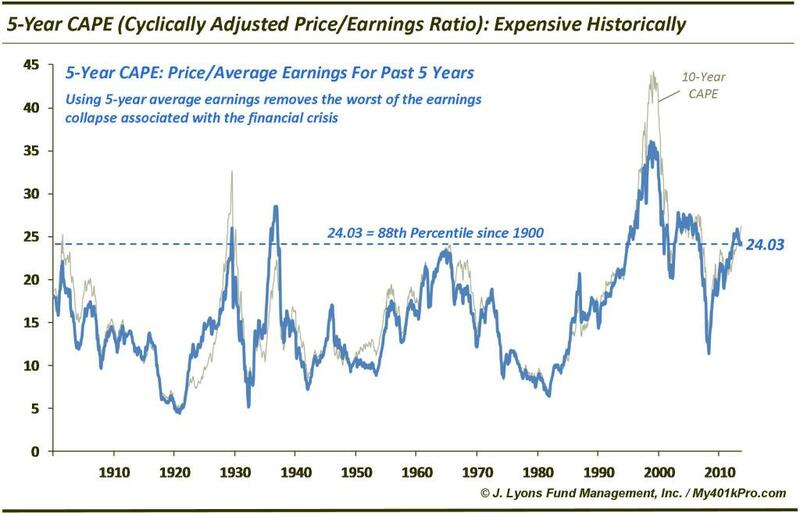 A crazy rate of ascent to crazy valuations, and then ultimately an even more devastating pop than stored up currently. 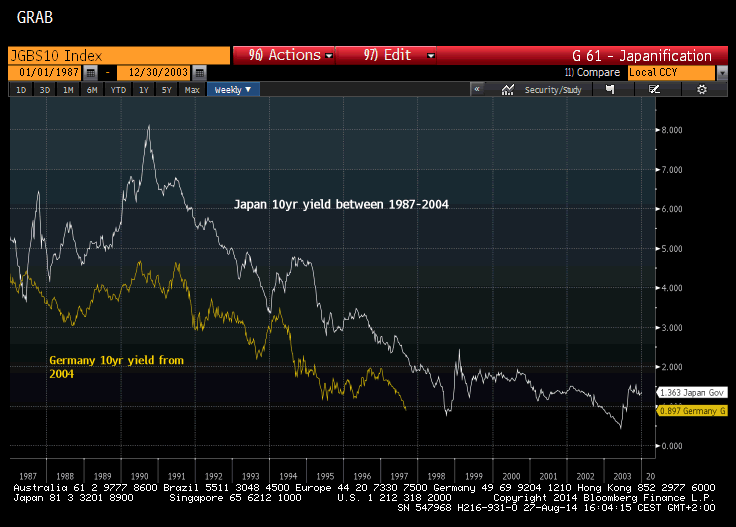 Like the Nasdaq in 2000, the Nikkei in 1989, the Dow in 1929. Although neither a demographic peak nor an economic boom peak like those three events, the combination of QE, low rates and a goldilocks economy (neither too hot nor too cool) provides different ingredients for the same kind of mania result. (Understand, I disagree with a lot of what I am writing in these first two alternatives, I am just presenting the opposition). Label (1) in both periods shows a first burst to what participants expect to be the peak, only for a running correction (2) to give way to an even steeper final termination leg higher (3). 5 months of crazy gains from ‘Here’ would take us to a January 2015 peak, which fits well as the other inverted geomagnetic seasonal peak of the year. 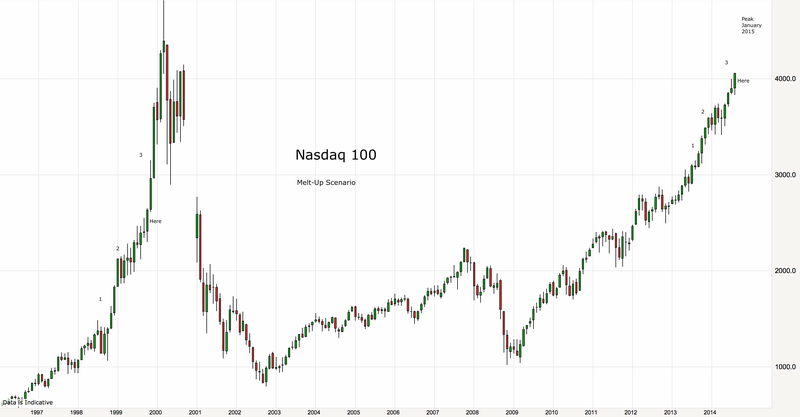 If the index did break into the kind of terminal velocity of phase (3) then, make no mistake, it would be the biggest stock market mania ever, because to accomplish it we would see the highest ever valuations, leverage, allocations, sentiment and more. 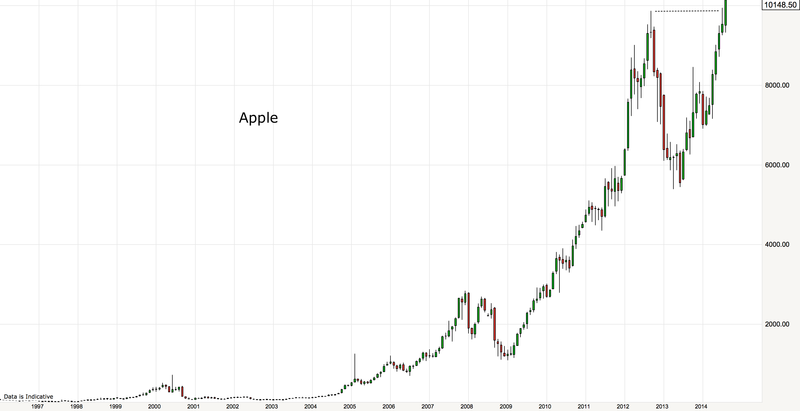 If Apple can finish August by consolidating this breakout, then it could be set for further gains in clear air above, leading the Nas100 higher. 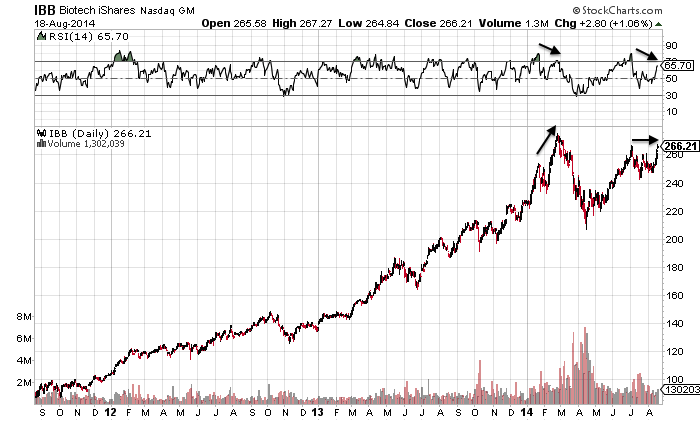 If Apple is repelled this week, it would keep the double top option in play. As you know this is my favoured option and I have detailed my case for this many times over, so if you are new to my site, read back through a few recent posts. This is the alternative to which all the evidence fits the best. 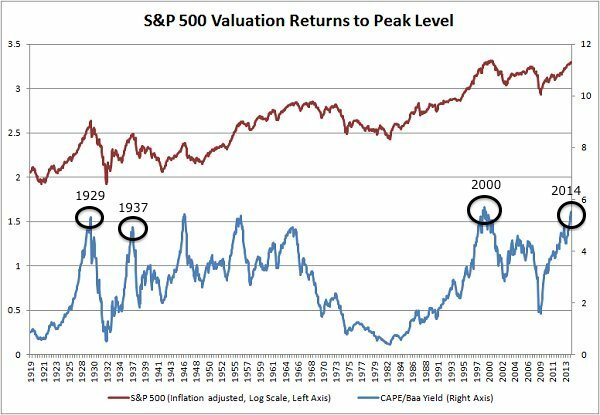 Valuations and demographics show us to be at a cyclical bull peak within an ongoing secular bear, whilst the list of indicator extremes and divergences are features of a major peak, rather than anomalies in a bull market. 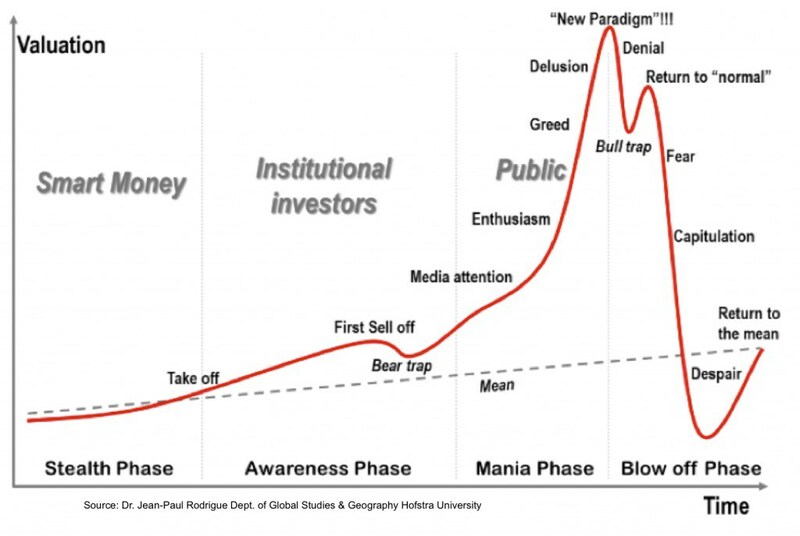 In the same way as for alternative 1, the stretched elastic band that those indicators depict means a period of heavy selling will feature in the erupting bear market, and the maturity of the indicator readings and divergences imply their satisfaction is likely very close at hand, in the period Aug-Oct 2014. Therefore, I would argue that alternatives 1&3 are similar in offering likely >20% bear gains imminently, whilst alternative 2 is the threat to my bearish stock-indices positioning. If alternative 2 fulfils, then, because of the demographic headwind, it will require all-new levels of leverage, equity allocations and skewed-positioning. In thin volume, like in 1937, a smaller group of participants has been able to rally the market to the current level by taking Rydex and fund manager allocations, margin debt and net investor credit to beyond those previous major peaks. In all 4 of those measures we already exceed the biggest mania of all time, 2000. 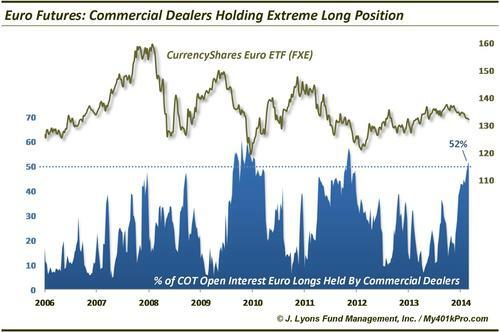 So, with less people available to buy the stock market, the only way to achieve the current market highs has been to stretch individual positioning and leverage to record extremes. 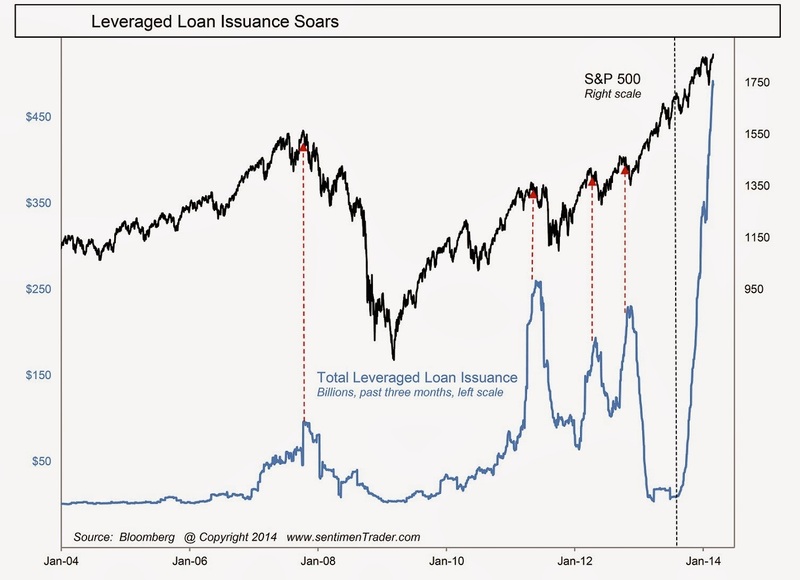 All the big blow-off top stock index manias of the past required leverage to rise into the peak. Therefore, with margin debt having so far peaked out in February, one important development would be that leverage peak being taken out. 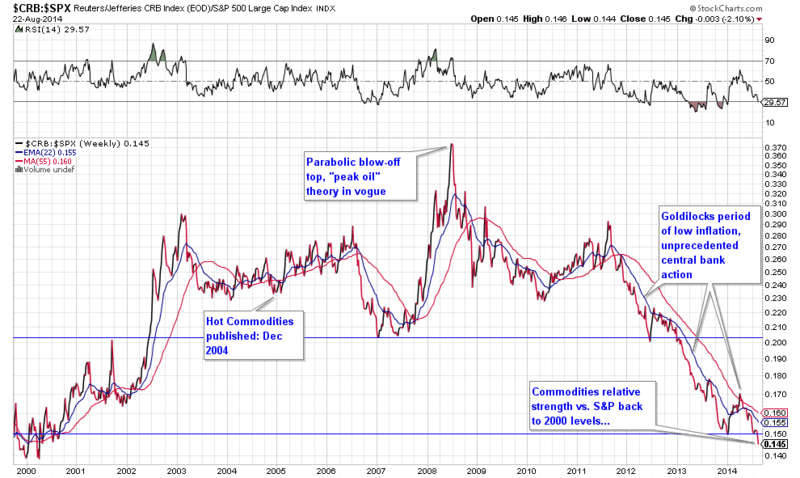 Tying in with that we would see various speculative targets break upwards. Expecting margin debt to be down in July, due to indices being down in that month, this last week in August becomes key, and we enter that with various investments showing obvious lines in the sand. 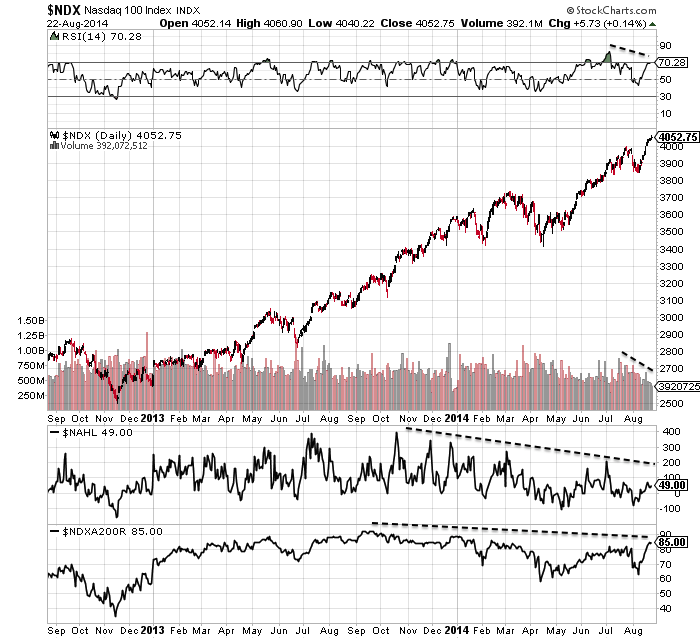 If IBB’s bubble has burst then it should tip over here under negative divergence. If not, it should break upwards and re-take the March high. 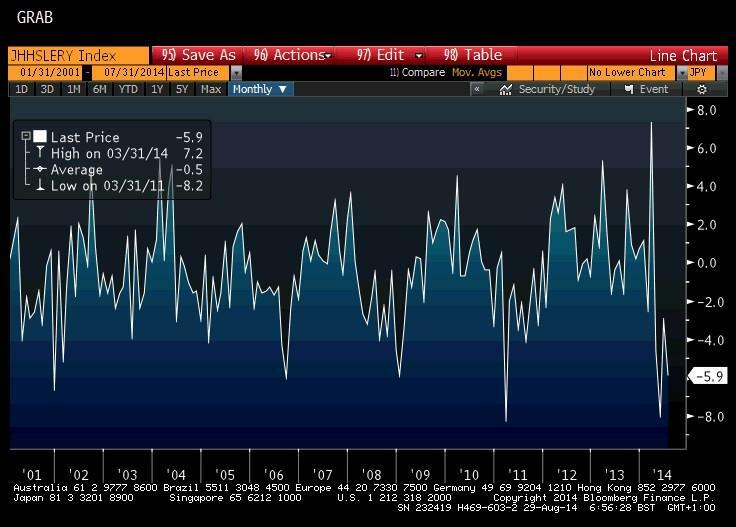 If JNK’s collapse in July was a true warning, then it should break down again here. 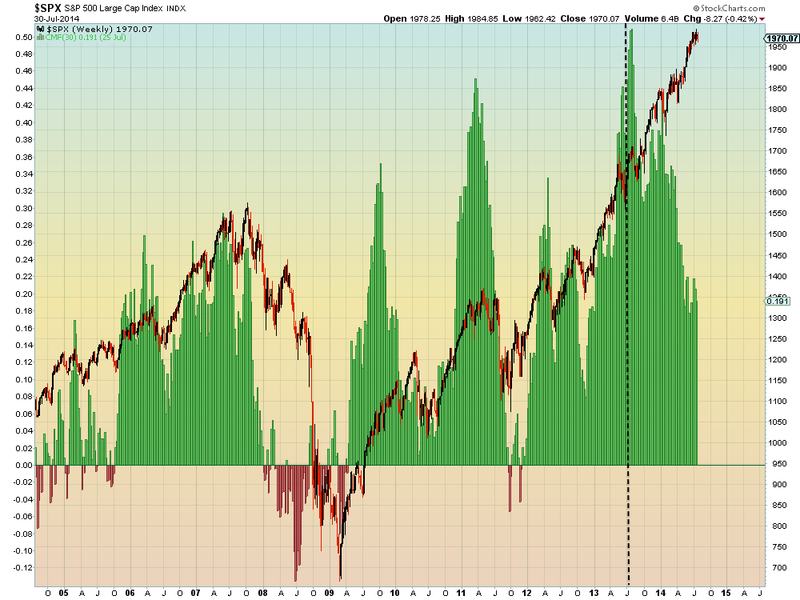 New highs would invalidate. 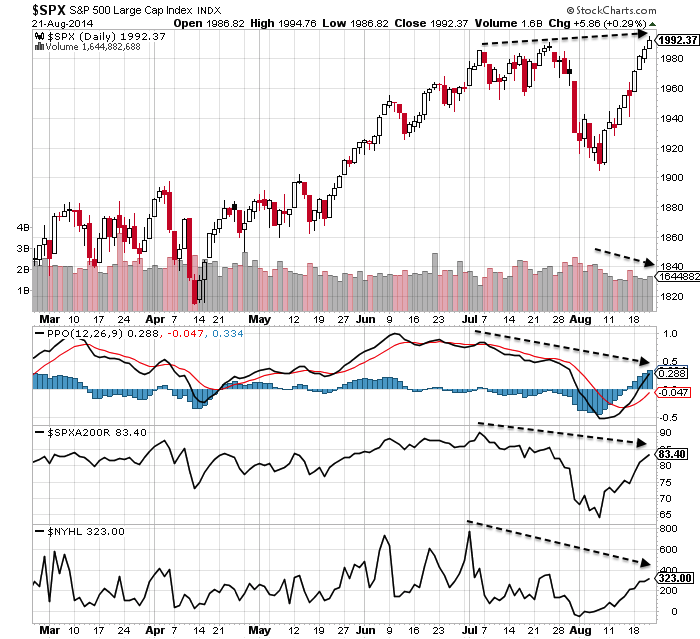 The SP500 will either tip over here with a marginal higher high on multiple negative divergences, or it will ignore those indicators and cement an upward breakout. I believe the next 2 weeks will be highly revealing. It is the lunar negative fortnight and indicators argue for a retreat. DeMark sell signals were reached at the end of last week, whilst today is the new moon and the last likely seasonal peak of mid-year. If stocks retreat from here it will make the SP500 breakout a fakeout and Dow will put in a lower high than July. 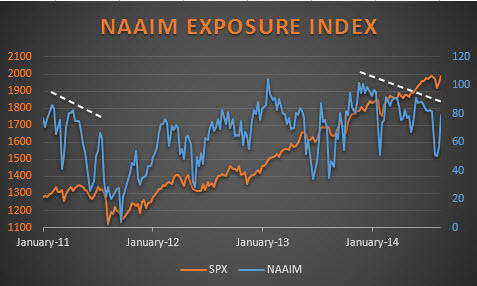 The February/March peak in speculative indices and sectors and margin debt will likely be maintained. 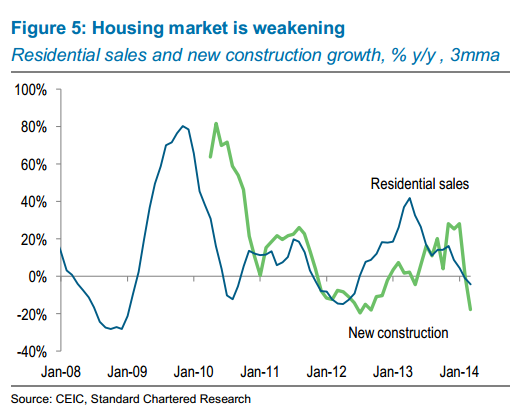 All those indicators that have been screaming ‘correction’ will move further towards validation. If, on the other hand, stocks rally this week and next and various speculative measures break or cement upwards, then the melt-up alternative will gain weight. At that point I would consider stopping my positions, moving aside and waiting, because it would put great doubt on the epicentre of the top as the speculation peak of Feb/Mar with margin debt, IBB, SOCL and RUT. 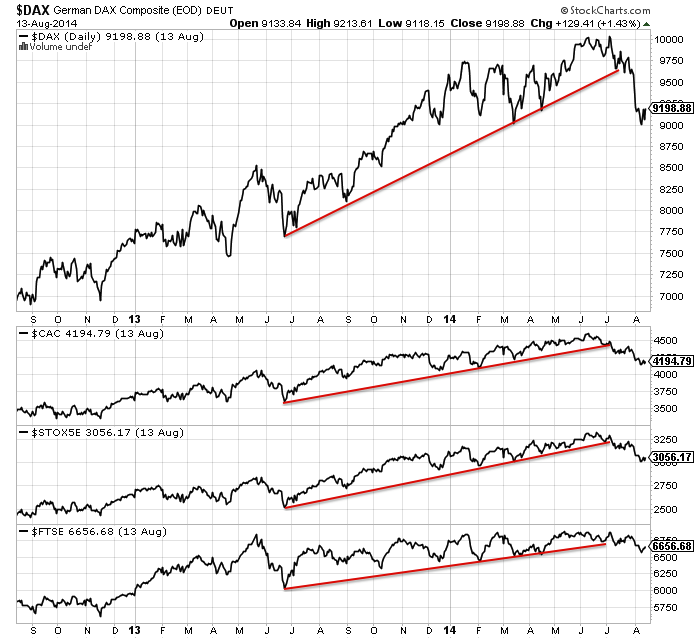 The Nasdaq chart above shows advance-declines have diverged. 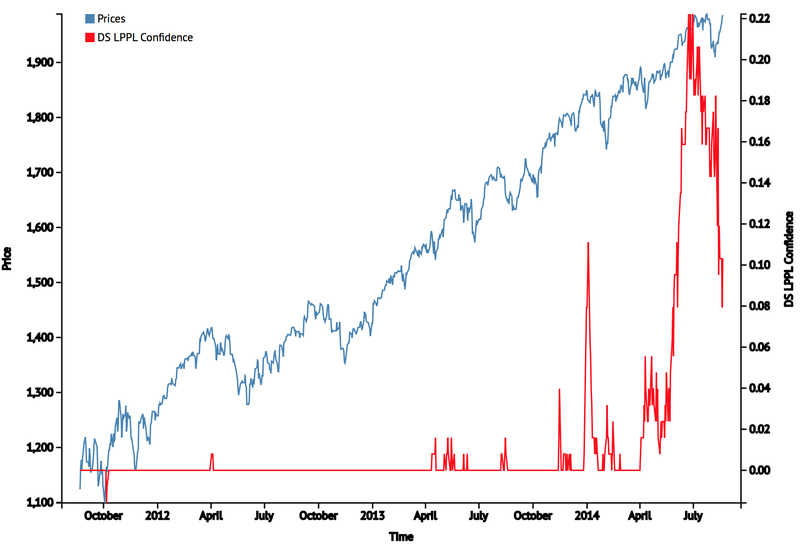 But NYSE advance declines continue to rise in line with the SP500. 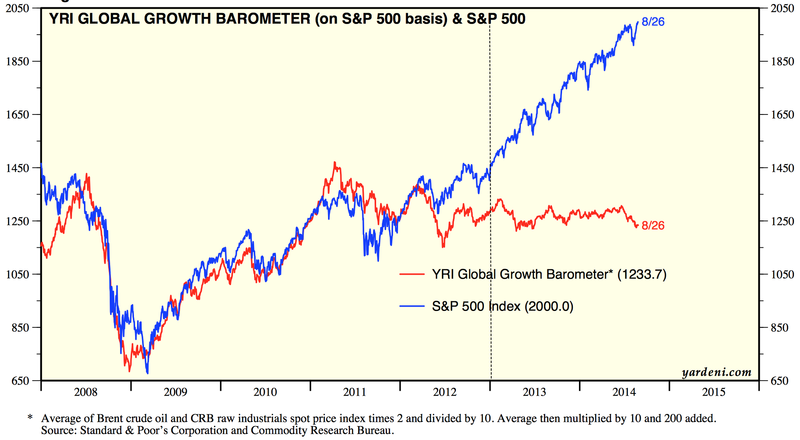 Does it need to diverge too before we see a proper correction? 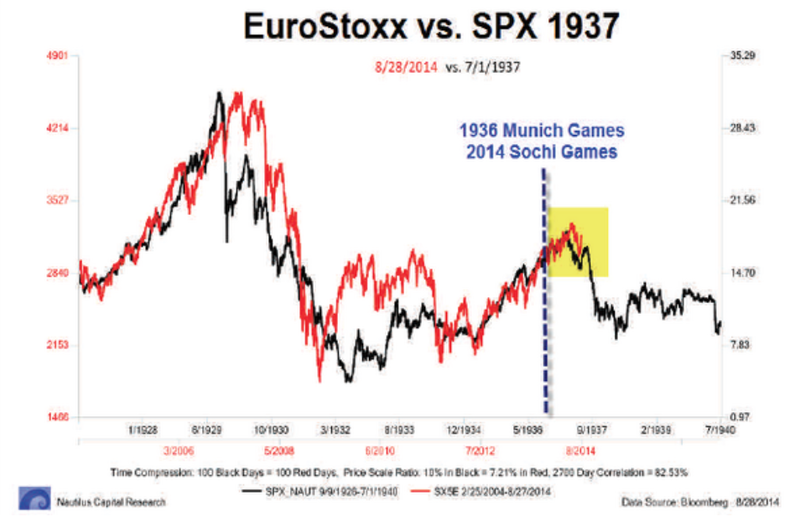 The chart below shows a divergence into 1929 but a simultaneous peak in 1937 and 1946. 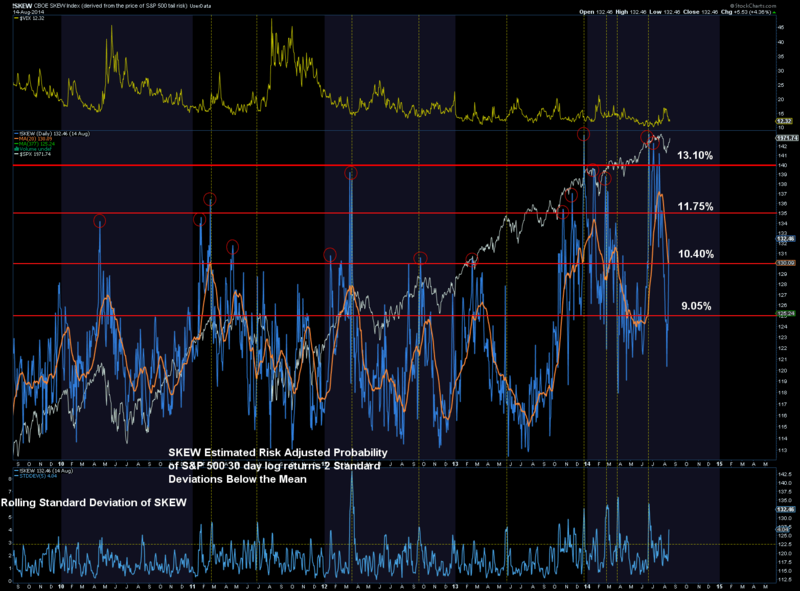 With other breadth divergences in play in 2014, I’m not convinced it does. As the three historical charts show, the ultimate market peak was always accompanied by a spike in DS LPPL, just not necessarily the highest spike. That means either July was the ultimate peak, or stocks are heading higher and we will see another spike in DS LPPL ahead, probably to a higher intensity level. 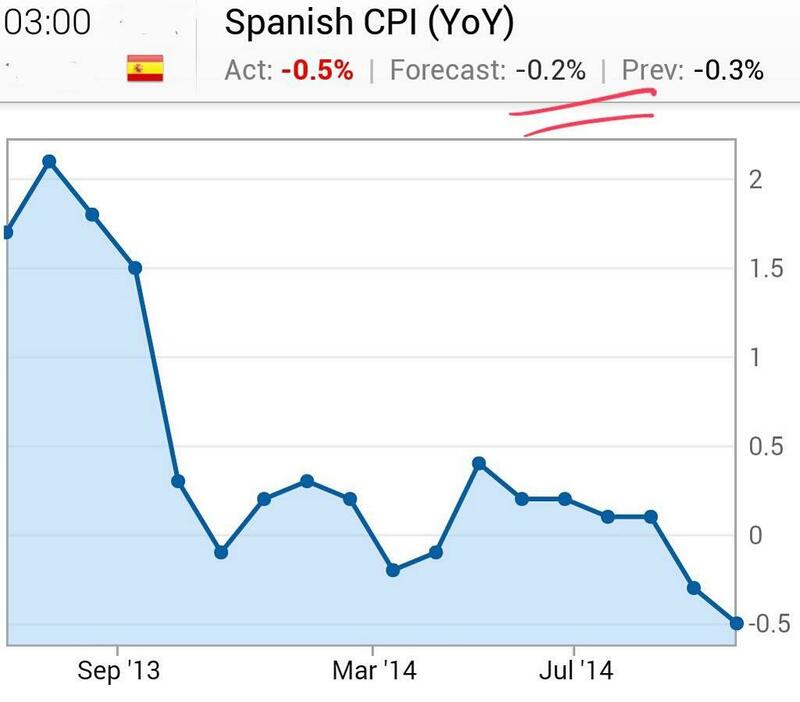 With Europe on the cusp of deflation, waning commodities prices may provide the tipping point. I would argue that those who believe we need to see a series of rate rises before the bull ends are failing to see that we do not have the luxury this time. Rate rises help kill bulls because they help choke off the economy. 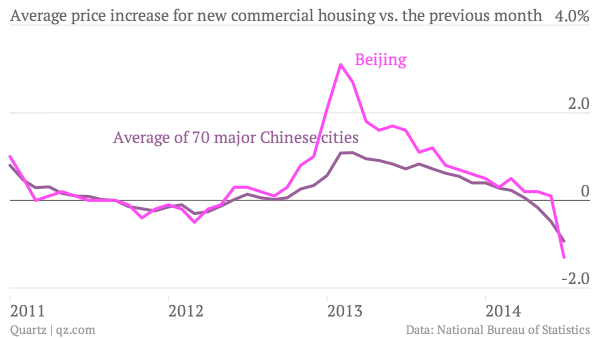 The global economy is too weak for rate rises, the choking is occurring without them. Which brings me back to alternative 2, the melt-up. Can we really challenge the biggest mania of all time without a demographic tailwind nor a booming economy, and from already-record leverage, sentiment and allocations? I find that extremely unlikely, but if we really can, then we surely equally see the biggest crash of all time as that is unwound. 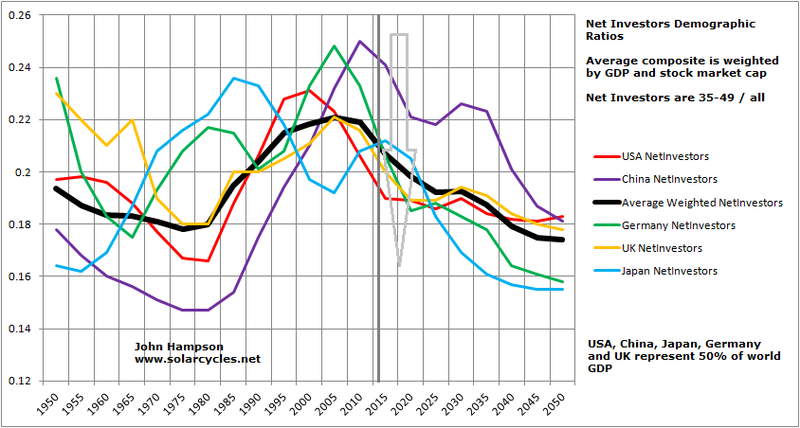 Instead, the evidence supports us being in a 1937 peak to the 1929 demographic/economic peak (1929 being 2000 in this case). 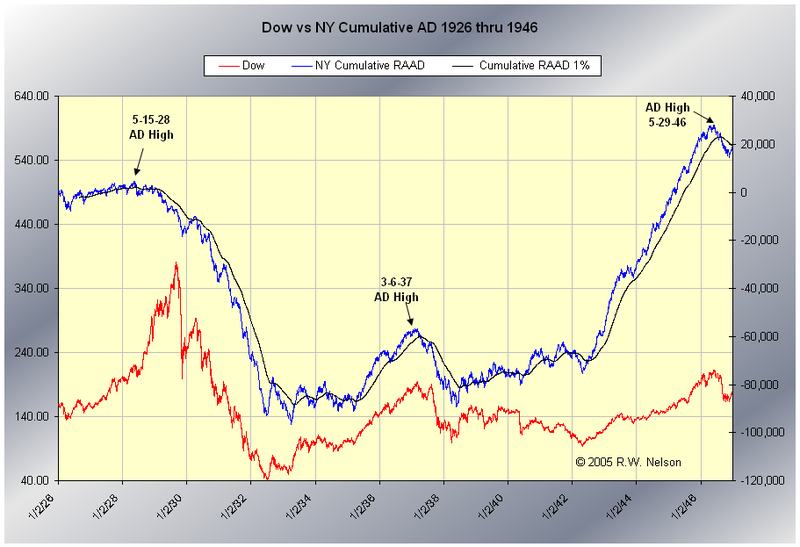 1937 did not see a parabolic blow-off, but rolled over with sufficient disconnect between valuations and the economy. The evidence still supports us being here in the last gasps of a topping process that began Dec 31st with a peak in risk, then followed with a speculation peak in Feb/Mar, then a final peak in July. 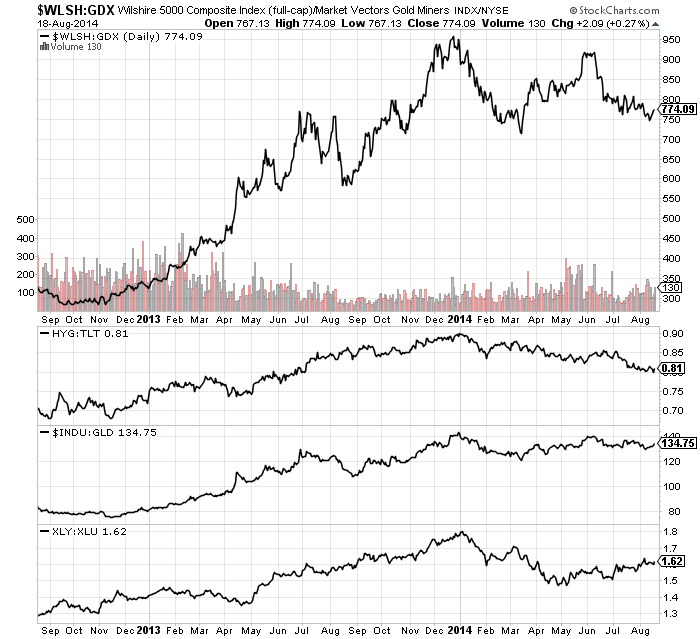 European indices appear to have decisively broken down, and US small caps are some way from their highs. The Dow broke down from its 2014 wedge in July, and volume has been very thin in US equities on this August rally back up. I have outlined my lines-in-the-sand above and see the next 2 weeks as the crucial confirmation or invalidation. 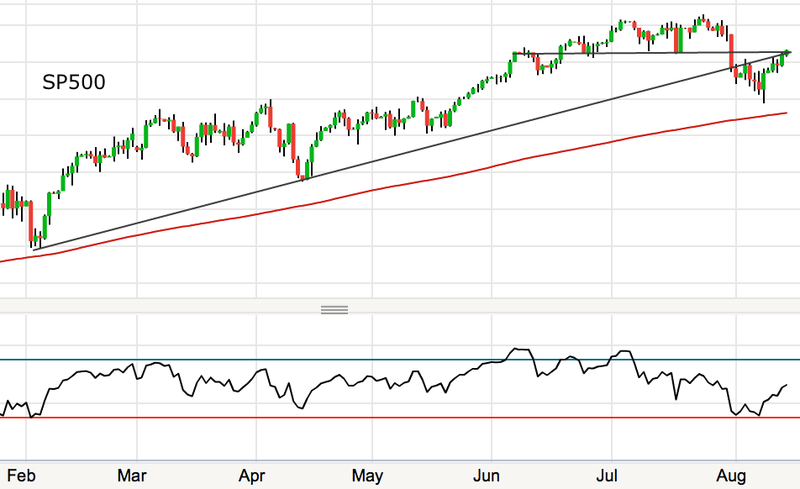 A double top here on the SP500 or another breakout to new highs? Below shows Aug 8th was another channel hold, so is it bull-business as usual or has something changed? 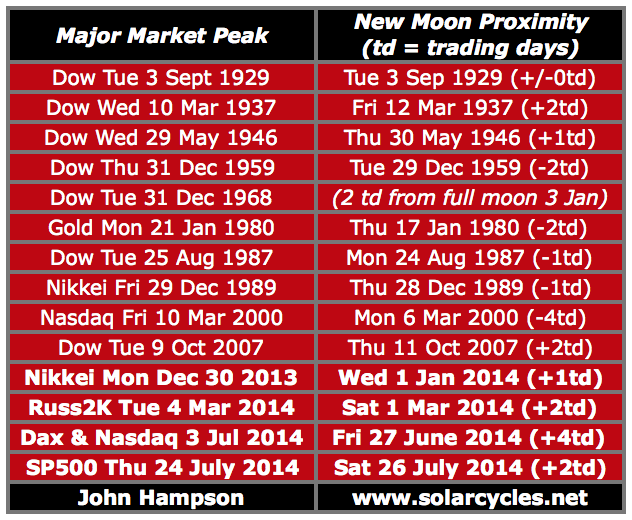 The new moon is on Monday and therefore we might expect the markets to roll over after that. US small caps underperformed yesterday and the Nasdaq gave back all its day’s gains in the last 15 minutes. In summary, the stronger case is for the rally to end here. 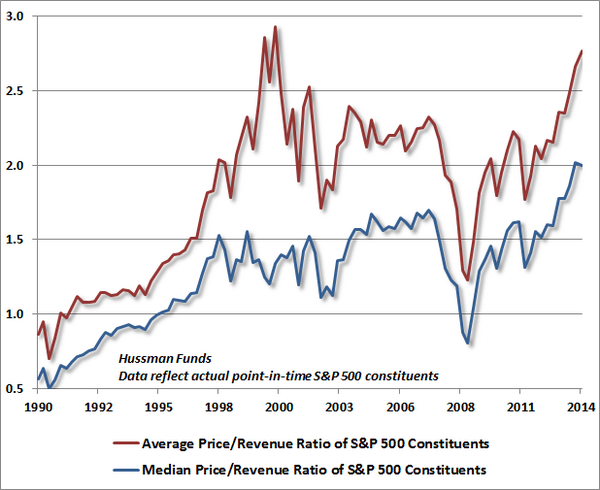 A marginal higher high on SP500 would not negate that. Around this weekend’s new moon is the most likely scene for that to occur if it is to. 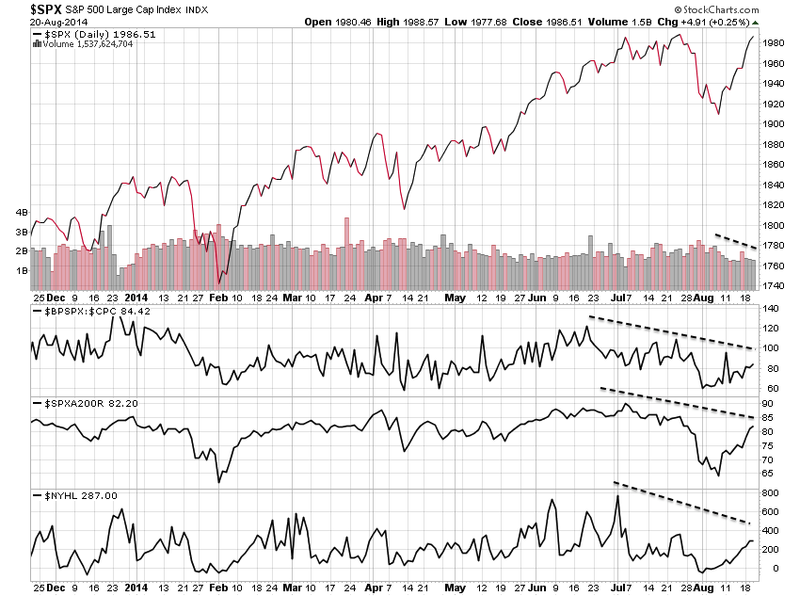 But effectively a double top, with indicators and divergences calling for chop-then-retreat or just retreat. 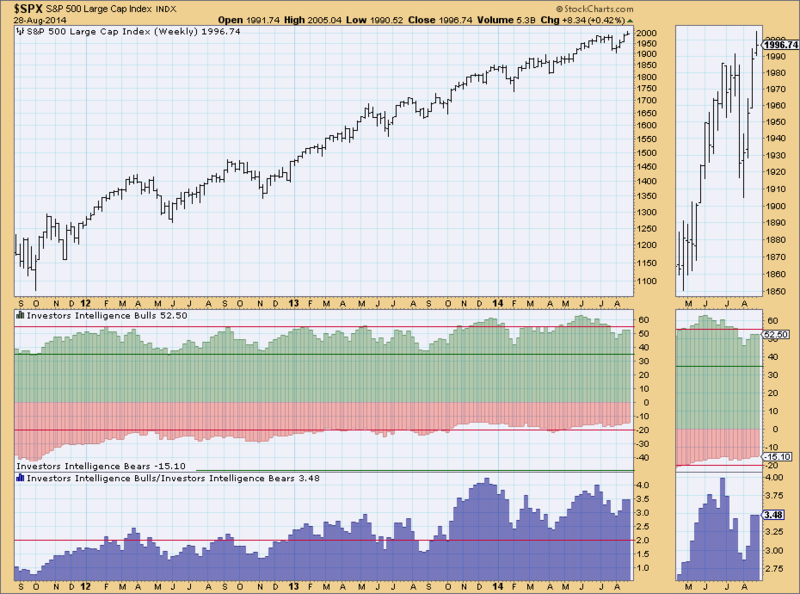 The two longer term charts above add to the comprehensive case for this being a major peak, and along with Rydex, II sentiment, Skew, sector rotation and risk-measure peaks call for the top being ripe or through. The evidence still supports the sequence of events: risk peaked 31 Dec 2013 (HYG:TLT, INDU:GLD, XLY:XLU and more); speculation peaked Feb/Mar 2014 (smoothed solar max, margin debt, IBB, SOCL, RUT) and the topping sequence completed in July (European indices, Dow, Sornette bubble, various indicator completions). So the last week in August – next week – is important. 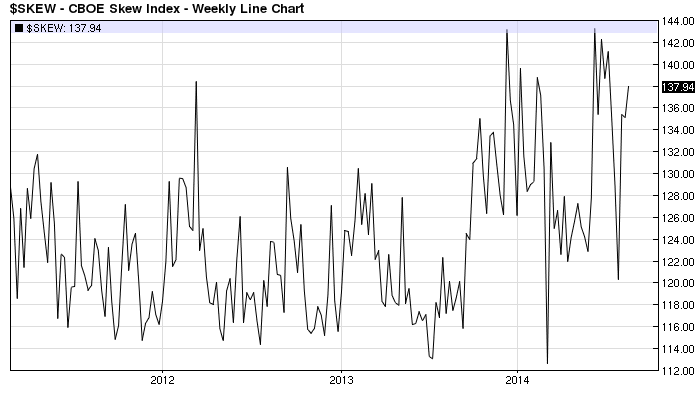 If it is an up-week then it will cast doubt on some of those peaks, if it is a down-week it will further cement them. Turning to the near term. We’ve seen a partial retrace of the falls, but all the evidence suggests this will now roll over and firm up the new downtrend, the new bear market. On European indices the technical breakdown is clear and the current retrace barely a blip in the downtrend so far. 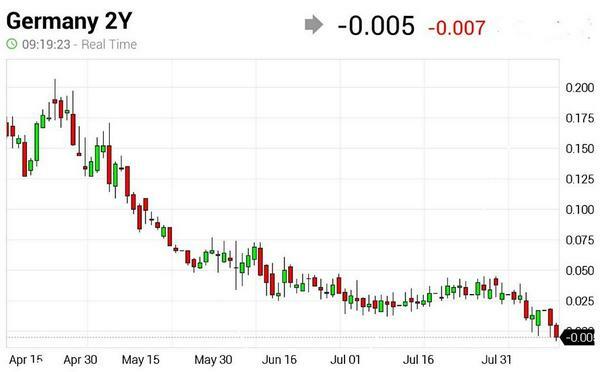 Germany announced negative GDP and France zero GDP yesterday. 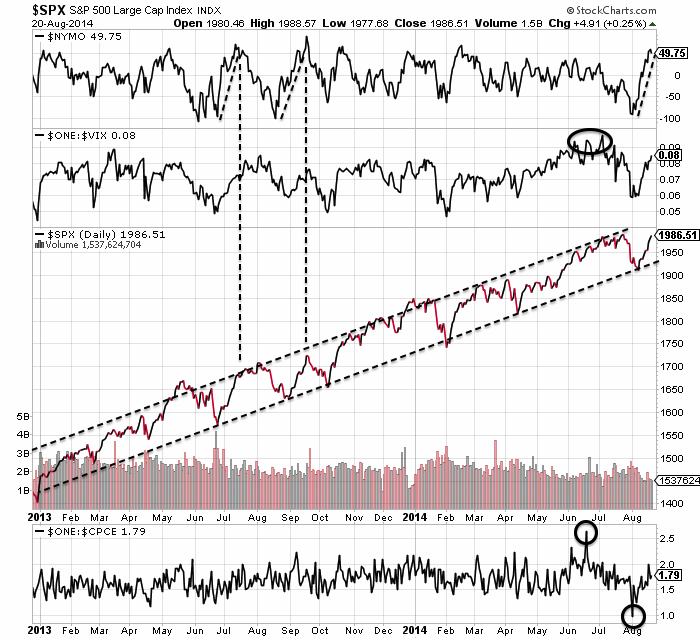 The SP500 now stands at twin resistance and this is an obvious point for the rally to roll over. 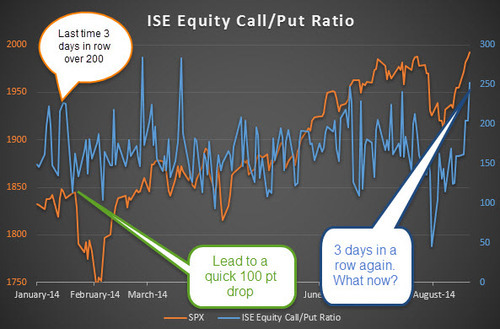 A look under the hood shows that volume has been thin and waning each day of this rally, and the best performing sectors have been healthcare and utilities, the post-peak duo. US small caps underperformed, treasury yields made new lows and crude oil broke down yesterday – all risk-off developments. Therefore I expect bears to resume control today or Monday. 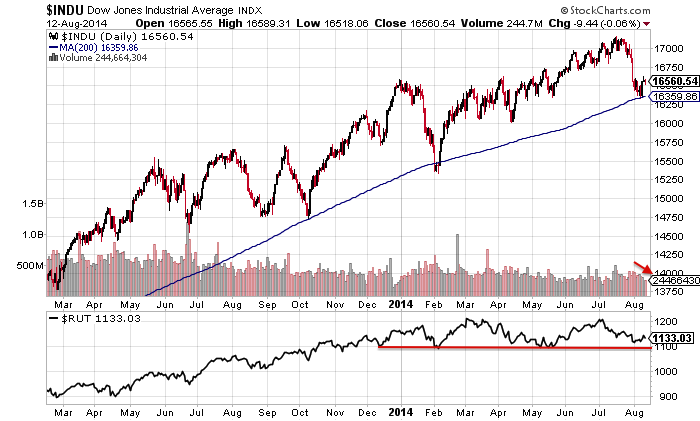 The Dow has been saved 3 times by the 200MA and the R2K 3 times at horizontal support. 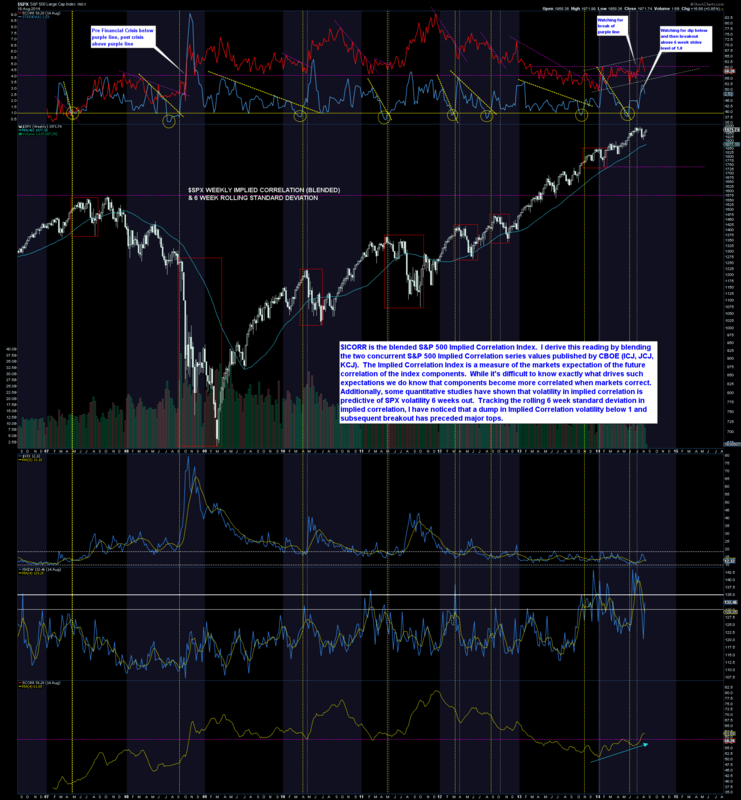 Looking for a technical trigger for the waterfall declines: both to break down and initiate the voluminous selling. 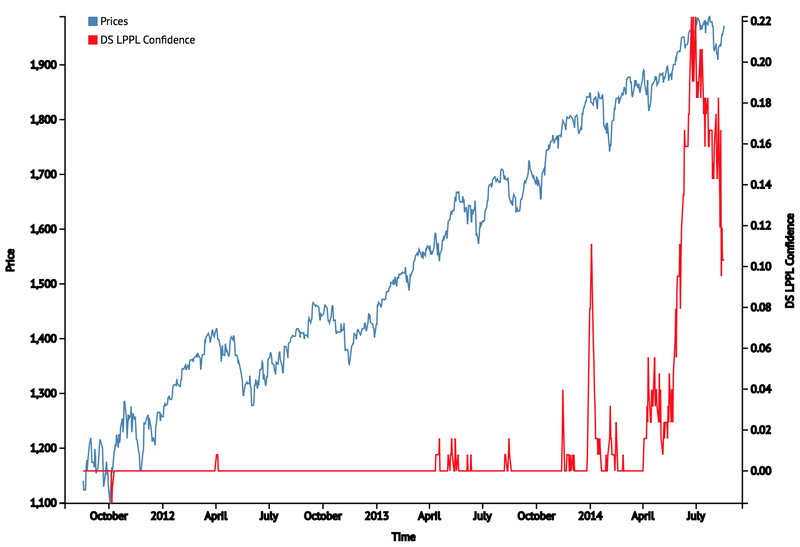 The small red arrow shows that volume has ebbed away the last 3 sessions; volume remains more dominant on down days. 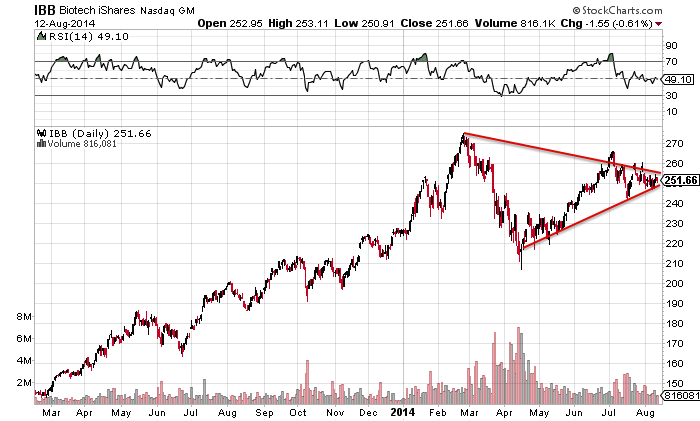 Biotech is in the nose of a triangle, ripe for resolution, adding to the case for the downside break to be close. 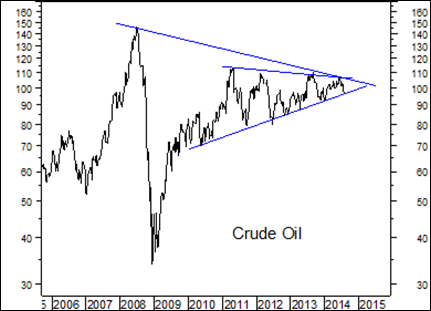 Crude oil also looks ripe for resolution. 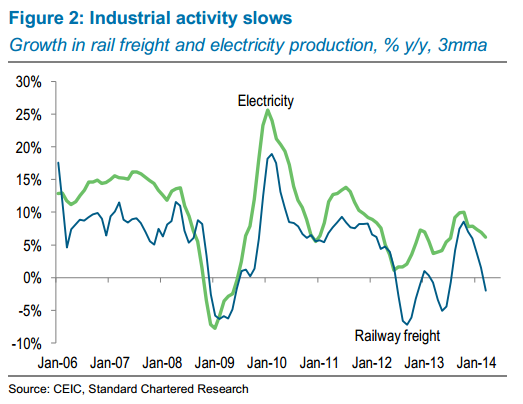 Weak growth and deflationary pressures suggest this will fall, along with equities. 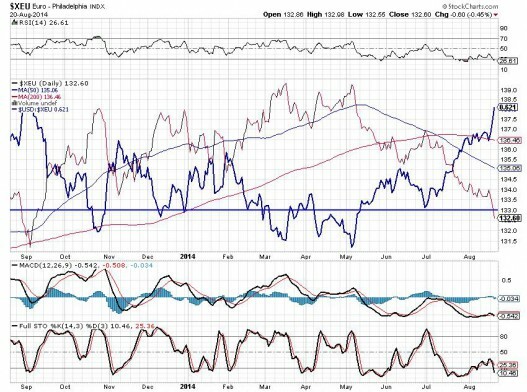 Meanwhile, gold and gold miners continue to make a sturdy base and I believe they will rise as safe havens. Demand for safe havens is high, with German 2-year bond yields turning negative. Investors are choosing a guaranteed small loss over the alternatives. 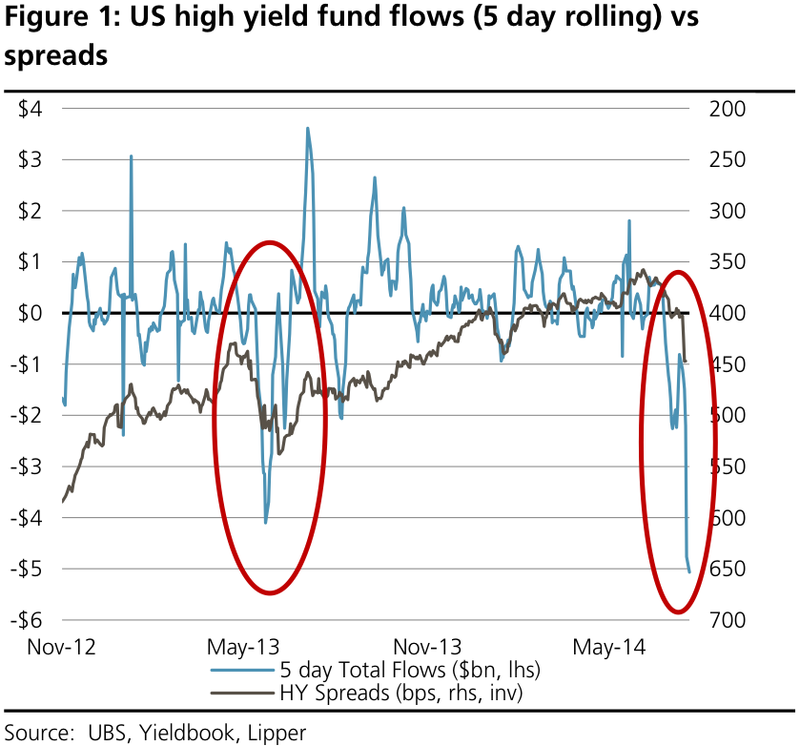 There has been a hurried exit from high yield bonds, an asset class that had become very lop-sided like equities. Investors went all-in on corporates in both shares and debt. 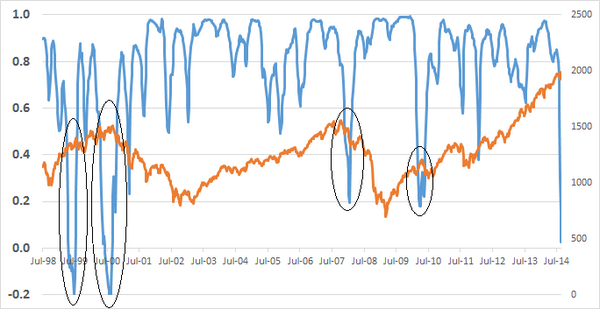 The SP500 levitation above the 200MA is second in duration to the the one that terminated in 1998. The subsequent 6 week 20% drop that occurred then is similar in speed and severity to the other analogs I recently drew together, and occurred in the typical window for drops: July to October. Fed officials’ vocalisations of ‘secular stagnation’ are being reported in the media, namely their belated realisation that maybe the economy is not going to normalise after all but remain weak and troubled. This was written in demographics all along and suggests they did not and do not understand that driver.